We care deeply about the success of your business on Amazon’s marketplace and advertising platform. Our mission is to assist our clients in realizing their mission by managing their Amazon sales channel through strategic guidance, keyword research, product listing copywriting, running Amazon Advertising, and managerial reporting. Our clients receive comprehensive support on all topics regarding Amazon. We're in constant communication with our clients via email, phone and web-conferencing. 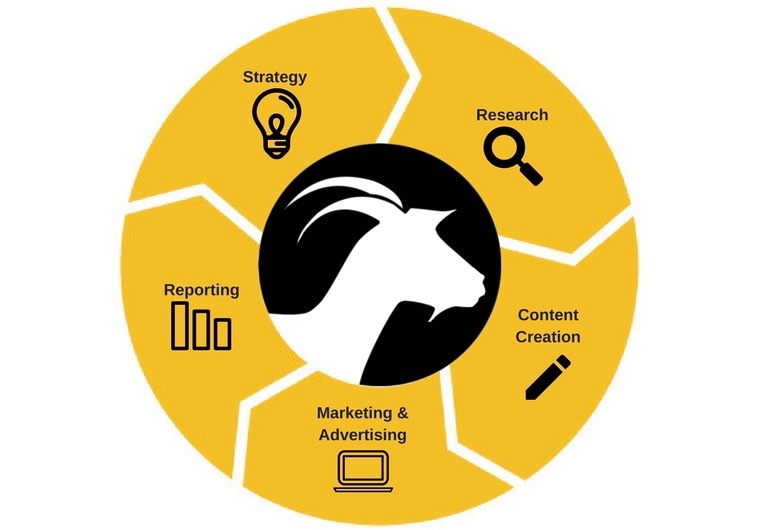 Goat Consulting integrates services seamlessly into our clients’ business by working hand in hand with their internal employees. Whether you're entering the marketplace or a veteran seller on Amazon, Goat Consulting gets your seller account up to speed fast. Clients are fully on-boarded, listed appropriately and advertising on Amazon. We have worked with a wide breadth of businesses and sales models including Vendor Central and Seller Central (FBA/Merchant Fulfilled). We understand the pros and cons of these business models thoroughly. We help our clients accelerate in their current business model, pivot into a new one or operate hybrid models. Understand the Amazon marketplace, the business model that works best for your brand or manufacturing business, buy box, and product detail pages. Learn how to properly market your products on Amazon and drive traffic to your product listings.